CARNIBOLIC™ contains a powerful Quattro-Carn Matrix consisting of Acetyl-L-Carnitine HCL, L-Carnitine HCL, L-Carnitine Tartrate, and L-Carnitine Fumarate. In a consumer market that is loaded with L-Carnitine products of varying degrees of potency and efficacy, the quadruple power of CARNIBOLIC™ is truly unique and is designed to elevate your supplementation to the next level! One of the primary functions of the L-Carnitine amino acid is to support your body to metabolize fat. It achieves this by carrying fatty acids from the bloodstream to the mitochondria of your cells to be used as fuel - while carrying waste products out. CARNIBOLIC™ works to support this process by ensuring that your body has surplus levels of L-Carnitine in 4 unique forms to help ensure that your body maximizes its usage of fat as energy. A major concern with athletes trying to lean up is that their body is storing fat faster than they can burn it off. This is especially true for indivudals who focus on anaerobic exercise (like weight lifting), which utilizes carbohydrates and the glycogen system as its primary energy source. By working to rev up your bodies ability to utilize fatty acids, CARNIBOLIC™ is designed to prevent your body from ever storing fat in the first place, no matter how you train. By targeting fat utilization and storage with the 4 forms of L-Carnitine found in CARNIBOLIC,™ you can help your body accelerate the process of achieving lean, defined musculature. Unlike other basic L-Carnitine supplements, CARNIBOLIC™ is designed with an innovative Quattro-Carn matrix that utilizes Acetyl-L-Carnitine HCL, L-Carnitine HCL, L-Carnitine Tartrate, and L-Carnitine Fumarate. These various forms are designed to allow for optimal integration of L-Carnitine into your natural cellular processes. While it is true that L-Carnitine is manufactured naturally in your body (categorizing it as “non-essential”) it is widely viewed as a highly beneficial component to any comprehensive training supplementation strategy. Saturating your body with additional levels of L-Carnitine can help to ensure that you have surplus amounts of this powerful amino available in the event of a deficiency. 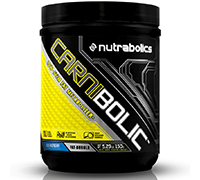 CARNIBOLIC™ is also designed to support your body to enhance its use of fat as a primary energy source. While L-Carnitine is produced naturally in the body, any athlete can use CARNIBOLIC™ to help ensure their body has excess stores of L-Carnitine available to increasing fatty acid utilization. This application is especially useful for individuals that may have lower resting levels of L-Carnitine. For best results it is recommended that athletes drink 1-2 scoops of CARNIBOLIC™ 2-3 times daily with a meal, to help support enhanced fatty acid utilization during food digestion through the day. As a supplement to help support fat-burning during exercise, CARNIBOLIC™ can also be taken immediately prior to physical activity. Cardiovascular Support Usage: Take 1-2 scoops 2-3 times daily with a meal or as directed by your qualified healthcare practitioner. Performance Enhancing Suggested Usage: Take 1-2 scoops on an empty stomach prior to workout or as directed by your qualified health care practitioner.